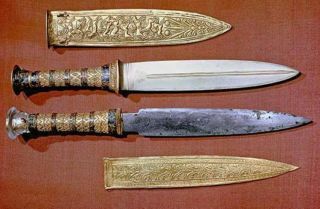 The iron dagger found in the tomb of the Egyptian pharaoh Tutankhamun dates to around 1350 B.C., about 200 years before the Iron Age. The portable analyzer can detect the chemical composition of objects by using a non-destructive scan with X-rays. Jambon tested the ancient iron daggers, including one from Pharaoh Tutankhamun's tomb in Egypt, iron axes and pieces of iron jewelry from the ancient Near East and China with X-ray scans to identify their metals. Most of the iron meteorites that smash into Earth each year are thought to have formed in the metal-heavy cores of planetesimals — small bodies in the protoplanetary disk of debris that orbited the sun during the early stages of the solar system. Archaeo-metallurgist Albert Jambon scans an iron meteorite with a portable X-ray fluorescence analyzer. His research showed that all the iron in the tested artifacts came from meteorites, and not from terrestrial smelting, he told Live Science in an email. Jambon examined some of the most ancient iron objects ever found, including sheet-iron beads from Gerzeh in Egypt, dated to 3200 B.C. ; an ax from Ugarit on the coast of northern Syria, dated to 1400 B.C. ; a dagger from Alaça Höyük in Turkey, dated to 2500 B.C. ; and three iron objects from Tutankhamun's tomb, dated to 1350 B.C. — a dagger, a bracelet and a headrest. The iron axe from Ugarit on the coast of northern Syria is dated to 1500 B.C., about 300 years before the invention of smelting iron. Some archaeologists have proposed that these early iron objects could have been created by "precocious" smelting of iron ore nearly 2,000 years before the technology became widespread in the early Iron Age — perhaps by accident, or through experimentation. "We know from texts that during the Bronze Age, iron was valued 10 times as much as gold," Jambon said. "[But] in the early Iron Age, the price fell dramatically to less than that of copper, and this is the reason why iron replaced bronze quite rapidly." His analysis also showed that Tutankhamun's dagger, bracelet and headrest were made from the iron of at least two different meteorites, suggesting that an active search was carried out for valuable iron meteorites in ancient times, he said. Jambon hopes to scan more ancient iron with XRF spectrometry, but access to these items is not always possible, especially in conflict zones like Syria and Iraq. Even studying artifacts in museums can be challenging, he said. This iron dagger from dagger from Alaça Höyük in Turkey is dated to 2500 B.C. — about 1,000 years before iron smelting was invented. "For obvious reasons, curators are reluctant to carry artifacts to a foreign institution, and this is why we need to travel,” he said: "This is why the portable XRF analyzer changed the deal." Jambon hopes his research will form the basis of a hunt for the earliest smelted irons on Earth. "The very first irons will be recognized from their chemical composition, which markedly differs from meteoritic iron," Jambon said. "Such analyses should be done for all irons between 1300 [B.C.] and 1000 B.C." "[This method] opens the possibility of tracking when and where the first smelting operations happened, the threshold of a new era,” he wrote in the study, published in the December issue of the Journal of Archaeological Science.